This pattern is so much fun! 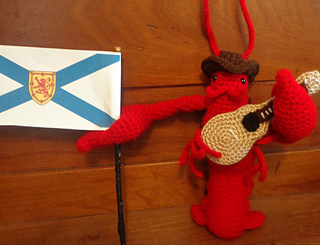 Nova is a free-standing Atlantic Lobster who makes a great mascot for maritime festivals. His claws are holders! He comes with a cowboy hat, a fedora, a chef’s hat, an acoustic guitar, an electric guitar and an apron. 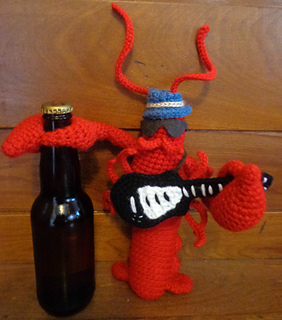 The perfect mascot for Blues & Country music festivals, as well as Seafood celebrations & the“Lobster Bash”, popular in my home province of Nova Scotia, Canada. 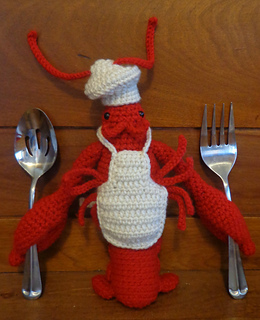 His accessories are removable and interchangeable, which also makes him a fun toy for children! This pattern is written in English and uses US Standard crochet terms. It is an intermediate level pattern, but the photo tutorials make it easy to assemble. Pattern purchase grants you permission to sell the finished item. 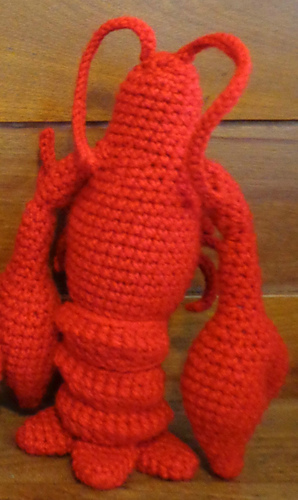 Hook G (4mm) for lobster if you crochet tightly OR a smaller hook if you crochet loosely.